The Stinky Footboard is the definition of a niche accessory and while you might not need one, the benefit of using one becomes crystal clear after seeing the genius of SteLuLu at work. Let us go ahead and get it out of the way. Stinky Footboard is a silly and corny name that is almost as absurd as the concept of a foot based input device for PC gaming. Once you get past the name and start actually using the footboard, it becomes clear that maybe it isn’t so absurd; the device that is because the name Stinky Footboard still sounds like something my 8-year-old self came up with after a bender on sugary treats. In a way it really starts to make a lot of sense because foot pedals are widely used in music allowing artists to modify their sound while keeping their hands busy with the music making. It should work just as well in gaming and thanks to the hard work of SteLuLu Technologies, we now know that it does. The Stinky Footboard is the definition of a niche accessory and while you might not need one, the benefit of using one becomes crystal clear after seeing the genius of SteLuLu at work. Most games require 3-4 sets of hotkeys modified by Ctrl, Alt, and Shift to keep everything within reach of a single hand. One solution would be to use the G13 Programmable Gameboard by Logitech we recently reviewed and the Stinky Footboard would be the other solution. The footboard contains 4 Cherry MX mechanical key switches — just like the ones in the G710+ keyboard also reviewed recently — which coincide with the four directions a foot can roll and place pressure. Hidden under the brushed aluminum are 4 Cherry MX key switches. By rolling the foot to the left and right and rocking it forward and backward, the footboard provides gamers with 4 keys to program and use. The heavily used modifier keys mentioned earlier are perfect candidates to assign but we found other setups to be just as useful. Assigning the forward key to a game’s sprint binding creates a natural feel we have for pressing our toes forward to go faster (thank automobiles). Obscure keys that would move the hand away from the movement keys would be another sound choice. Nearly every genre of game can benefit from the Stinky Footboard but the most natural fit has to go to racing games. An input device made to be used by feet would have to be tough and able to take punishment. 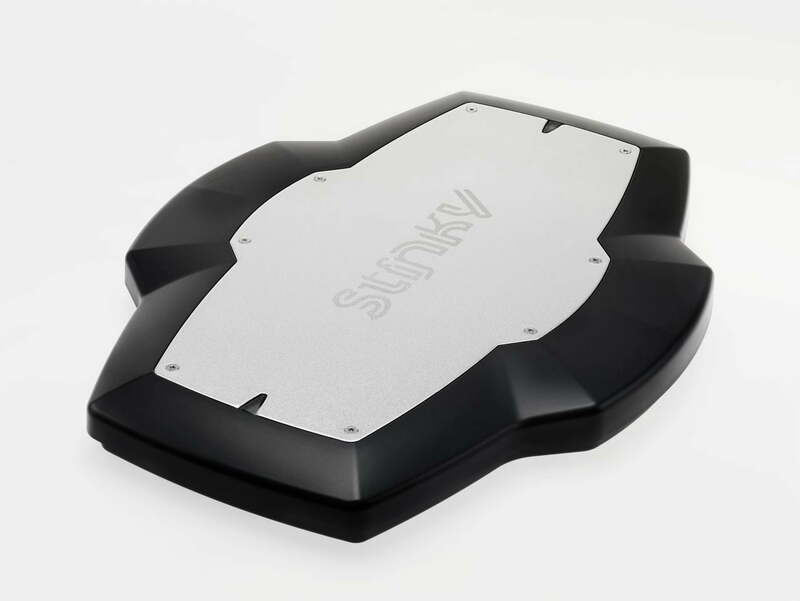 The Stinky Footboard was designed exactly for that with a foot long piece of brushed aluminum sitting atop the footboard surrounded by heavy-duty black plastic putting the final size at around 14.5 by 11 inches. The insides of the footboard are housed in a steel frame providing a surprising amount of durability that can support even the stinkiest and largest of feet. Nearly 4 pounds are supported by the eight raised feet with feature that special rubber keeping it from slipping and sliding away. Raised rubber feet keep the board from slip sliding away. Located on the bottom of the board are adjustable springs in interchangeable torsion boxes (TBOX). With an Allen wrench, the springs can be tightened or loosened to affect the responsiveness. The board even comes with 2 extra of each of 3 different types of springs — soft, medium, and stiff — on top of the 2 soft and 2 medium already in the board. These springs can be switched in and out to give the footboard an even wider range of response. Stinky Footboard uses the traditional USB input with a 6 foot micro USB cord and requires a Windows XP or higher pc. A key binding program is required and available for download from the website. The simple interface allows you to program the 4 different switches on the footboard including the behavior such as pressing the key down, a complete up and down key press, or pulsing. Once all 4 switches are programmed, the profile can be saved and loaded into the footboard’s on board memory as needed. The Stinky Footboard is one of those products that you never thought you wanted until you actually use it. It feels natural and allows players to keep most of their keys within reach of a single hand without it contorting trying to hit modifier keys. With game changing products like the Oculus Rift coming with fancy VR, it will be products like the Stinky Footboard that help us augment that reality even further to provide more realistic gameplay experiences.